I was introduced to Town's music earlier this year, posted it up, and it just keeps getting better every time I listen. 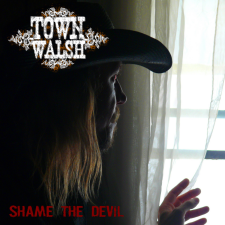 See the posting HERE featuring the tune "Cold Light of Day" off the Shame the Devil CD. Nominations to the Texas Music Awards are open to the public for a short time. Town Walsh is eligible for many of these awards so let's get him nominated! The Rising Star Award and Singer/Songwriter of the Year would be good ones, but you can nominate him anywhere you want. Please follow this link below and nominate away! Public nominations close on Jan. 12th so please take a moment and do it real soon. Town Walsh was born and raised in Oak Cliff, Texas. His parents being both teachers and musicians saw to it that he learned to play piano before he could ride a bicycle. When he was 13 his big brother taught him some licks on the bass and all the chords on the guitar. In high school, Town formed his own "Rap" band, and at age 19 he was performing live in Deep Ellum with a heavy metal/punk band. He has been in several bands over the years covering many genres of music. Town’s major influences are the Rolling Stones, Dwight Yoakam, and Steve Earle. Town met his wife Lisa in 2000 and now resides near Weston, Texas. Town has been prolifically writing songs for years and said it was time to get some of his own music recorded, which he did just that and it was well worth the wait! Town Walsh music appeared to be a great example of talent. I am more than excited to write at http://www.selfgrowth.com/articles/what-are-the-side-effects-of-low-self-esteem my review on his songs.